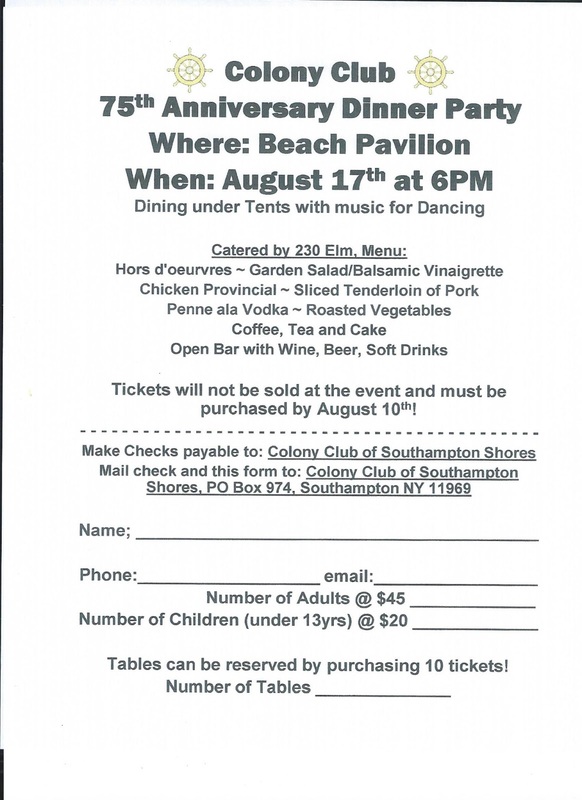 Southampton Shores: 75th Anniversary Dinner Party~Aug. 17~Tickets available now! 75th Anniversary Dinner Party~Aug. 17~Tickets available now! Tickets must be purchased by August 10th. In the past , several generous residents have donated door prizes. If you would care to do so, please contact Guy or me. If you deal with a local business, would you ask them to donate a gift certificate for this very special occasion? Their donations will be noted and displayed at the party. Once again, the Barbolinis have donated a $100 gift certificate . Thanks so much for your generosity! If you have a group of 10 you can reserve a table. Don't miss out on what will be a wonderful evening of celebration!